Dendrochronological analyses of wood samples recovered during recent excavations have provided the first reliable date for the construction of the unique Roman gateway in Trier. By establishing a secure date for the construction of the famous Porta Nigra in Trier on the Moselle, archaeologists at LMU have solved a longstanding puzzle. The unique entrance gateway flanked by two towers was built by the Romans, who founded the city that was originally named Augusta Treverorum. Analysis of the material recovered during excavations supervised by Christoph Lindner, an archaeologist in Professor Salvatore Ortisi’s group at the Department of Provincial Roman Archaeology, shows that the representative fortification was built in 170 CE. 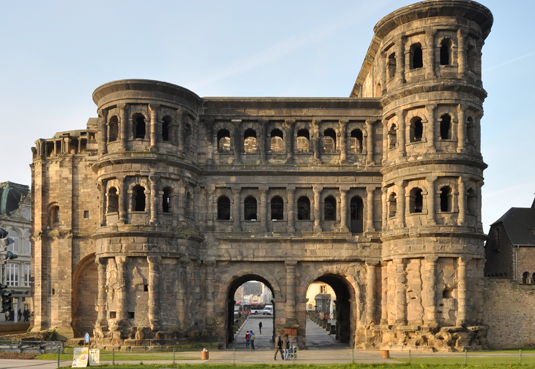 The Porta Nigra is one of the most famous of all surviving Roman monuments north of the Alps, and is included on UNESCO’s List of World Heritage Sites. The monument formed part of the city wall, which was erected in marshy terrain close to the Moselle. “This posed major difficulties for the construction crews, as the foundation pit had to be drained,” says Christoph Lindner. He and his team of excavators deliberately chose to dig in a spot which seemed likely to yield remains of the timbers used for this purpose. And indeed, in the course of their excavations, the researchers discovered portions of the wooden pilings used as cladding to line the building trench. Dendrochronological analysis of these samples performed at the Rheinische Landesmuseum in Trier revealed that the trees from which the pilings originated had been felled in the winter of 169/170. “This is the first firm scientific proof for the date of construction of the structure,” says Lindner. It is also compatible with estimates based on previous archaeological and architectural evidence.